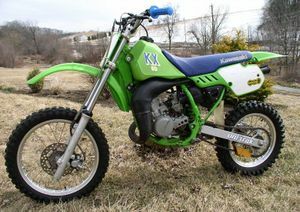 The Kawasaki KX80 is an entry level competition motocrosser for younger enthusiasts that was produced from 1979 - 2000 . 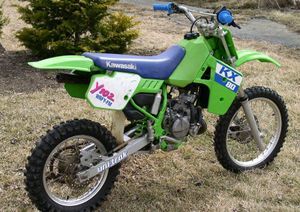 It competes in the 80cc class and was upgraded to the 85cc KX85 in 2001. 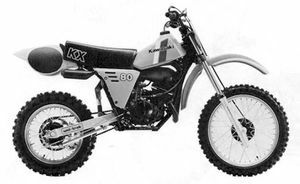 Marking, power up, longer suspension stroke, box section swing arm, front fork. 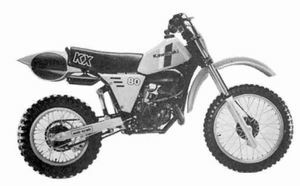 Remarks:Motocross racer for younger enthusiast. 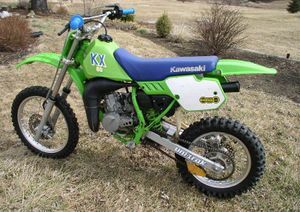 Air adjustable front fork, uni track, CDI system. Remarks: Motocross racer for Younger enthusiast. 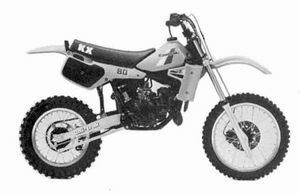 Air adjustable front fork, uni-trak rear suspension. 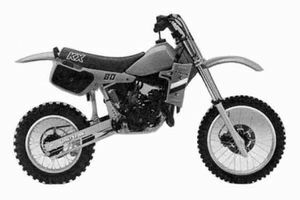 Remarks: Motocross racer for Younger enthusiast. 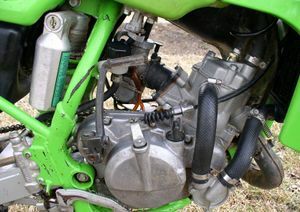 Liquid cooled engine, CPI system. Air adjustable front fork, uni-trak rear suspension, front and rear drum brakes. Changes: Graphic, marking, seat loga, power up. Front disc brake. 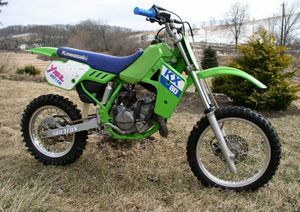 Changes: Color & graphic, swing arm, uni-trak link, air cleaner housing, radiator shroud & guard, power up. 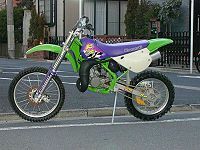 Color : Lime Green Beginning Engine No. 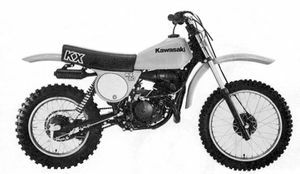 : KX080RE000001 Beginning Frame No. 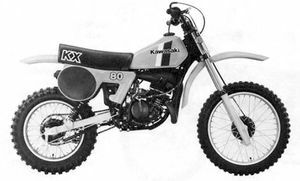 : KX080T-000001, (C)(U)J KAKXWTI ( )MA000001 PC NO. : 9991 7-1 438-02, (C)(U)99961-0316 OM NO. : 99920-1 546-01, (6)99922-1.60241, (F)99947-1078-01, (G)99923-1302-0'1, SM NO. : 99924-1 144-01. This page was last edited on 30 December 2010, at 16:22.